I think most Burnley fans that saw the Clarets play at any time from the mid fifties through to the early seventies will probably include John Angus at right back in their all time best Burnley team. Angus was a mainstay for several years and, alongside Jimmy McIlroy, holds the record for the number of post war appearances for the club with Burnley his only club. It was back in 1954 that he first arrived at Turf Moor. He'd been a centre half at school up in Amble, Northumberland, but was switched to right back when he played junior football for Amble Boys Club. He was spotted by our top North East scout Charlie Ferguson. Always very much a home bird, he suffered from homesickness and returned home soon afterwards but was persuaded to return in the following year and signed as a professional on his 17th birthday in September 1955. Whoever it was that did the persuading had done our club a massive favour. Such was the strength of our playing staff at the time that the young Angus couldn't even get into the reserve team and had to wait a year before making a debut. It came in the week of his eighteenth birthday and incredibly less than a week later he made a first team debut against Everton during an injury crisis amongst our defenders. He calmly and coolly got on with his game, marking out Everton's outside left Tommy Eglington a dual international in Ireland. He played over half of the games that season as he and David Smith vied to replace regular right back Harold Rudman. By 1958 Angus had made the position his own and was about to play in one of the greatest periods in the club's history. Over the next few years he played in the Championship winning team of 1959/60, missing only one game, in the European Cup the following season and then in the 1961/62 season he followed that up with a place in the FA Cup Final team. It wasn't just Burnley where he impressed either. In 1957 he was called up for England Youth and in 1959 got his first call up for the Under-23 team. He went on to win seven caps at Under-23 level. Then, at the age of just 22 in May 1961, and alongside Burnley team mate Brian Miller, he made his full international debut for England against Austria in Vienna. Both Burnley players played out of position with the left footed Miller at right half and Angus playing in the unfamiliar left back role. England manager Walter Winterbottom said of John's performance that day that it was one of the finest international debuts he'd ever seen. Quite why it proved to be his last international remains a mystery. It was once said that he wasn't too keen on the travelling or being away from home, but whatever the reason he never played representative football again. Whilst his Burnley full back partner Alex Elder chipped in with a few goals, Angus was by no means a goalscorer and after over six years in the team he'd still not found the net. Then in October 1964 he finally got his first, and second. Injured in a game at Arsenal, in the last season before the introduction of substitutes, he was moved to centre forward after getting injured and scored both our goals in a 3-2 defeat. In January 1966 he scored in successive home games against Fulham (a 1-0 win), and Chelsea (giving us the lead in a game we lost 2-1) but that was his sum total in well over 520 league and cup games for the club. Towards the end of the 1960s he lost his place for a while to the up and coming Fred Smith but it wasn't the end of Angus. He came back and was first choice again during our last two seasons before relegation. He was in the side for the first two games of the 1971/72 season but in the second of those games, against Luton, was injured. For weeks the fans were told he was close to full fitness but the truth was that his career was over. John Angus never played for Burnley again. The last of the 1959/60 Championship team had played his last game and an era of magical football was well and truly over as Burnley set about getting back into the top flight. They did just that in 1973 and right on cue we were staging a testimonial for John Angus. What a night it was and in front of a big crowd of over 15,000. It started with a veterans v youth team game when one youngster Brian Flynn dared to nutmeg manager Jimmy Adamson. 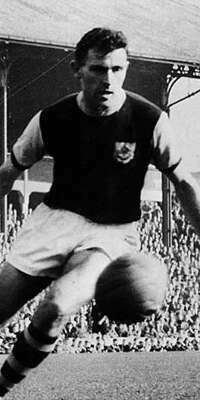 The main attraction in this game though was Jimmy McIlroy, back in a Burnley shirt for the first time in over ten years. The main game saw the Burnley team of the time take on a team of ex-Clarets who had been sold by the club. Had we sold a better goalkeeper than Peter Mellor we would probably have lost the game but won it 4-3. It really was just about a final farewell for Angus who has very rarely returned to Turf Moor although I did have the privilege of capturing him and full back partner Elder together in a photograph in 2004. He was known as 'Cool John Angus' and he was just that. He was also very tough tackling and strong. But once in possession of the ball he could quickly turn defence into attack with some astute passing. You always felt secure defensively with him in the side and it must have been a dream for wingers such as John Connelly and Willie Morgan to have him playing behind them as we set up attacks. Simply, for me, John Angus was the finest full back I've ever seen play for Burnley. I hate the use of the word legend at times; it is used far too often and far too readily. John Angus though was without doubt a Burnley legend.